Caring for cat litter box is one of the most crucial parts of human – cat relationship. While, usually it does not cause problems at all, even a small bump on a road can cause things going terribly wrong, and the cat habituating eliminating outside the box. In our previous article in the series we talked about brushing your cat’s coat, but now it’s time to take care of his litter box. What’s the best cat litter box? First, you will need a cat litter box and a scoop. The box itself should be large. As large as you can afford to find a place in your home. Best would be choosing a non covered box, as they are not always very appealing to cats, while if you are able to clean it quite often or you do have just one cat, it might work well for you. You can read more about advantages and disadvantages of covered boxes here. Also, you will need more than one box. There’s a general rule you can read more about here, that you will need one box per every cat, plus one additional box. So, if you have one cat, in most cases you will go okay with two boxes. The cat litter scoop is a shovel you will need to remove the wastes from the box. We recommend using firm scoop, which is not too flexible, and with hole sizes larger than particles of your chosen cat litter. If you use clumping litter, we also recommend having two scoops, one with larger holes for quick removal of solid wastes and clumps, and one with fine screen, for cleaning up smaller particles that fall apart from the clumps. It happens often. How to choose the best litter type? 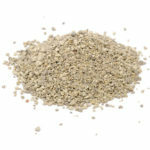 Now, since we already mentioned different cat litter types, we will talk about how to choose the best type for you. There are plenty available, and no one of them is all purpose single solution. For example, most cats are fine with clumping litter, and many avoid pine litter. 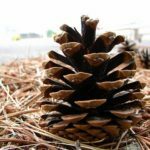 Clumping and silica litter are easier in use, while pine litter fights odor better. 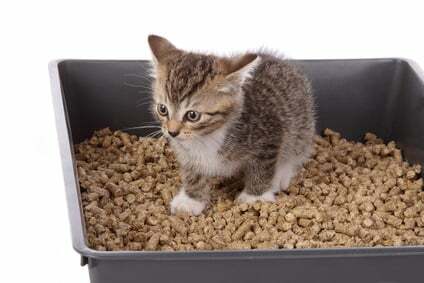 To learn more, read this article: How to choose the best cat litter type. Initially though, it would be a great to have the same litter type as in your kitten’s previous home, but you can start gradual switch to your desired one, as soon as he begins to feel comfortable in your home. Which is the best location for your cat’s litter box? Now, that you have a litter box and it’s filled with litter, we can find a place where to put it. The quality of the location will assist in determining how willing your cat will be using it. Best locations are close to activity spots of your cat. Like, if he’s sleeping in one room, and gazing at the bird feeder in the other, you might, either place a litter box in each of those, or in a room which is close to both of them. However, do not place it next to your cat’s food or water. He will not like it. Location should also provide security, but it’s little different than what we understand as secure. There are two sides of it. First, cat might object if the box is too close to scary objects, like washing machines, or dog’s teeth. On the other hand, cat must not feel trapped, which why rooms with at least two entrances are the best choices. Read more about proper locations of the litter box here. Train your cat to use the litter box. For most cats litter box training is easy and all it takes, is to provide a proper location. It’s in your cat’s genes to bury wastes, and, if you make sure the litter box is the only place which provides it, it’s more than half of the success. Especially, if previous caregivers of your new cat were responsible about this task. If you do have problems, though, read our article about litter training a kitten. Next comes the cleaning. It’s the task you will need to do most often, for the rest of your… your cat’s life. We want you to be aware of the very high importance of this task, as, insufficient cleaning of the litter box, is the number one reason for cats not using it. Do the scooping of solid wastes and clumps (if using clumping litter) at least twice daily. On some occasions, your cat might find it okay if you do it only once per day; meanwhile, some cats require it after every use. If you are the lucky owner of such a cat, and are not able to monitor the box all day, solution is to put more litter boxes in separate locations, so there always is a fresh choice for your pet. How to clean it depends on the litter type. Like, clumping litter requires to remove solid wastes and clumps, and dump the whole box occasionally. 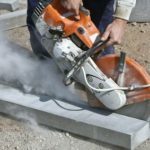 Silica requires to remove solid wastes, and dump the whole box every now and then. Usually, the litter package contains instructions. Also, you should dump the whole litter box either weekly or every other week, depending on soiling levels. Pour completely all of its contents in the trash and wash the box with a soapy detergent. Let it dry and fill with the litter again. If you do keep the litter box clean for most of the time, you are about to ensure that litter box problems will never bother you and your cat. Though, you have to keep in mind that litter box maintenance, especially when problems occur is very complex. Your cat’s appeal to the box depends on so many things that it is not able to explain it in one article. 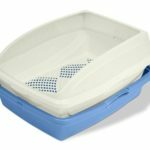 If you want to get greater knowledge about it, you should explore our article series about cat litter box related stuff. This article is a part of series: “How to care for your first cat“. In the next article, we are going to write about worming a cat. Stay tuned! How can you avoid dusty cat litter?